Observer’s and air gunner’s flying log book for Eric Horace Woods, navigator, covering the period from 28 November 1939 to 10 July 1946. Detailing his flying training, operations flown, instructor duties, operations with transport command and post war flying. He was stationed at RAF Stapleford Abotts, RAF Hamble, RAF Penrhos, RAF Upwood, RAF West Raynham, RAF Finningley, RAF Hemswell, RAF Watton, RAF North Luffenham, RAF Woolfox, RAF Cranage, RAF Wigtown, RAF Lyneham and RAF Bassingbourn. Aircraft flown in were, Anson, Westland Wessex, Avro Avalon, Envoy, Battle, Harrow, Demon, Blenheim, Hart, Hampden, Manchester, B-24, Oxford, Albermarle, C-47, York and Lancaster. He flew one operation with 106 Squadron, 4 night operations with 144 Squadron and 25 night operations with 61 Squadron. Targets were, Bordeaux, Essen, Magdeburg, Hannover, Kiel, Borkum, Mannheim, Hamburg, Bremen, Cologne, St Nazaire, Dusseldorf, Weser River, Karlsruhe, Krefeld and Frankfurt. He also flew 101 wartime transport operations with 511 Squadron. The log book is annotated with a brief biography, and cuttings about aircraft and operations. This content is available under a CC BY-NC 4.0 International license (Creative Commons Attribution-NonCommercial 4.0). It has been published ‘as is’ and may contain inaccuracies or culturally inappropriate references that do not necessarily reflect the official policy or position of the University of Lincoln or the International Bomber Command Centre. For more information, visit https://creativecommons.org/licenses/by-nc/4.0/ and https://ibccdigitalarchive.lincoln.ac.uk/omeka/legal. Great Britain. 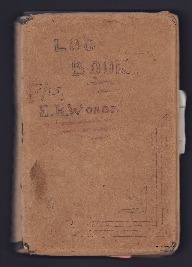 Royal Air Force, “Eric Horace Woods’ observer’s and air gunner’s flying log book,” IBCC Digital Archive, accessed April 24, 2019, https://ibccdigitalarchive.lincoln.ac.uk/omeka/collections/document/16288. Can you help improve this description?